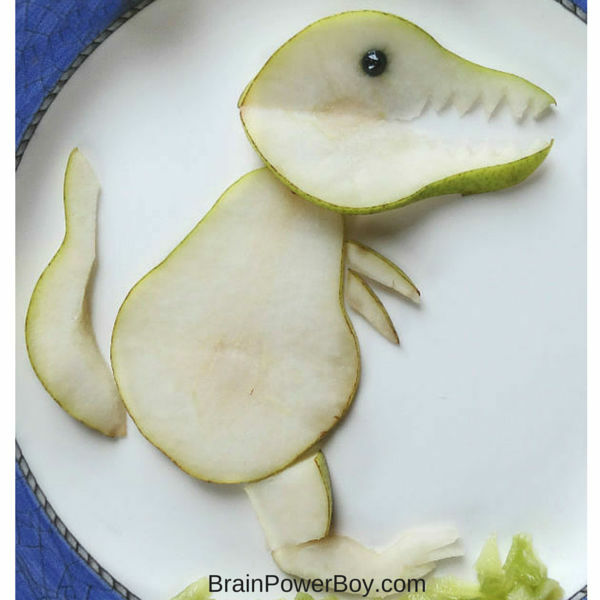 Make this super neat fun food dinosaur out of pears. I am a big fan of fun food. It is just so darn cute. I like to dabble a bit myself and have made some breakfast, lunch and snack ideas for my son over the years. This article is part of our fun food series on cooking with boys. Let them help you make a dinosaur snack! This dinosaur is made out of a pear! It is very easy to make. Use the pictures as your guide and read through the instructions below. Black Food Gel or a chocolate chip for the eye. The pear is used for the dinosaur, the kiwi is cut up for the grass and the peach is used for the sun. Using the image above you can see how to slice the pear for the head. I simply sliced a piece of pear straight down and cut it in half. Once you have the pear halves you can put them together to make a dino head. Then cut out the teeth with a sharp knife. Add a little eye with some black food gel (this is the brand I used.) If you do not wish to use food gel you can add a mini chocolate chip instead. 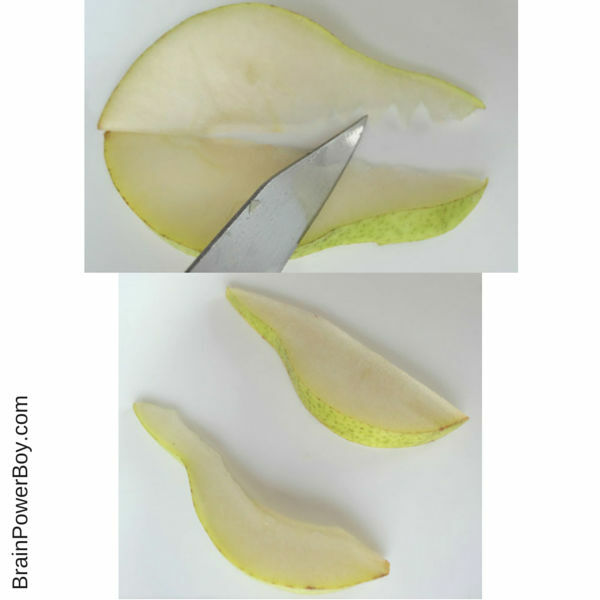 Shape a pear slice into the dinosaur tail. I cut a scooped shape out of the flesh side of the pear. As you can see in the picture above you use a whole slice of pear for the body. I used a slice from the middle of the pear since it was the largest. I cut the little front legs from scraps. For the leg, cut a small chunk and flip it so the green part is facing right. Cut claws at the end of the foot so make it more dinosaur-like. 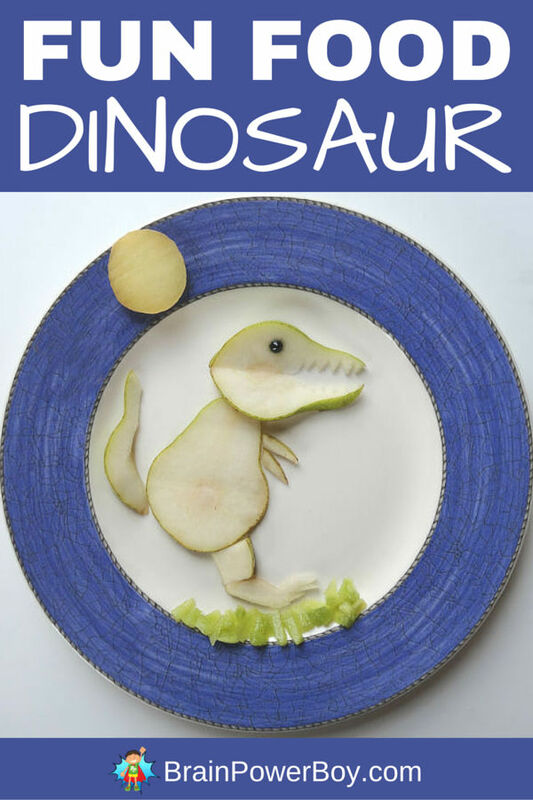 As I said, it is pretty easy to make and your dinosaur fan will be very excited to get this nutritious fun food fruit plate as a snack. See more things like our fun food dinosaur on our fun food page. Today we are working with other websites to gather together information for a nutrition unit study. Make our fun food dinosaur and go see what other nutrition ideas you can use from below. I’m so happy to hear you are going to make it 🙂 I hope you both have fun with it.